Padmasana is a meditative pose and its main purpose is to allow the practitioner to sit for extended periods of time without moving any part of the body and keeping body steady and still. Deep meditation also requires the spinal column to be kept straight throughout the practice and Padmasana satisfies this condition. A regular practice of this Yoga Pose will help in the overall blossoming of the practitioner, just like a lotus. The arrangement of the legs in this asana is such that it resembles the petals of a beautiful Lotus flower, and hence the name Padmasana. Spread a Yoga Mat and Sit it with legs stretched out in front of the body. Slowly and carefully bend the right leg from the knee and place the right foot on the left thigh. The sole of the foot should point upward and the heel should be close to the pubic bone. Bend the left leg from the knee and place the foot on top of the right thigh. With both the legs crossed and feet placed on opposite thighs, place the hands on the knees in either chin or jnana mudra. Keep the spine in the upright position and keep the shoulders relaxed. Close the eyes and become aware of the body, relaxing it completely. In the final position, there should be a perfect alignment and balance of the body. In case there is any problem in overlapping the legs and sitting in Padmasana, Ardha – Padmasana (Half – Lotus pose) should be tried first by placing any one leg on the opposite thigh. The practice of Ardha-Padmasana should be continued until enough flexibility is achieved to progress to Padmasana. The practice of Ardha Titali Asana and Poorna Titali Asana will be most useful for preparing the body to sit in Padmasana. 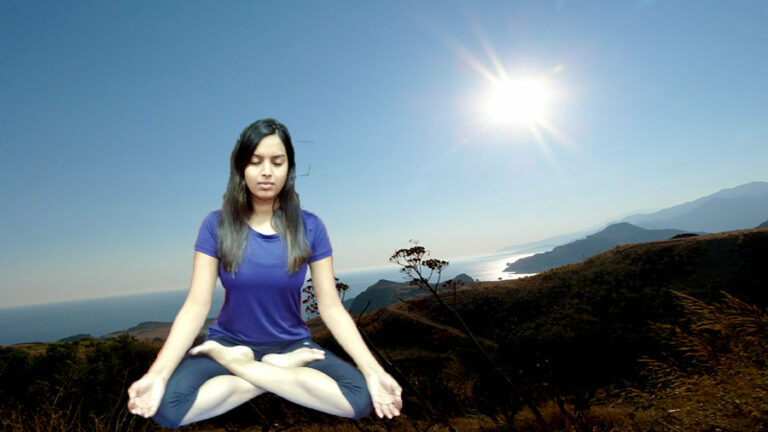 Second important point is that while practicing Padmasana, either of the right leg or left leg can be placed uppermost as it is a matter of personal preference and depend upon whichever is more comfortable for the practitioner. People suffering from sciatica should not practice this asana. Pregnant women should avoid Padmasana as the circulation in the legs is reduced. People suffering from injured or weak knees should avoid this asana. If there is discomfort or pain in the legs after sitting for some time in Padmasana, slowly unlock the legs and massage them. When the blood circulation has returned to normal, resume the asana. Do not strain the knee joint while moving into or out of Padmasana. Never use undue force to sit in Padmasana. Padmasana allows the body to be held steady and in still pose for long periods of time. This asana holds the trunk like a pillar with the legs playing the role of a firm foundation. This asana relaxes and calms the mind. Padmasana directs the flow of pranas, the vital energy, from the Mooladhara Chakra to the Sahasrara Chakra, enabling the practitioner to reach higher stages of Meditation. The asana has a relaxing effect on the nervous system. The blood flow which is redirected from legs to the abdominal region stimulates the digestive process. Without securing a steady asana, one cannot progress well in meditation. If one can sit still and steady in Padmasana even for an hour, he will be able to acquire a one-pointed mind and feel the initial peace and the soulful peace inside him. Another important meditation posture is Siddhasana. For Siddhasana read the post – Siddhasana (Accomplished Pose) – How Siddhasana Is Useful In Heart Attack & Blood Pressure.